These world class loads merge the legendary Sierra MatchKing Boat-Tail Hollow Point projectile with Federal’s patented premium delivery system. MatchKing is Sierra’s preeminent target bullet, featuring a small meplat hollow point design with a drag-reducing boat tail shape o deliver a high ballistic coefficient. The accuracy of these target bullets is acclaimed worldwide, winning more target competitions than all other target bullets combined. 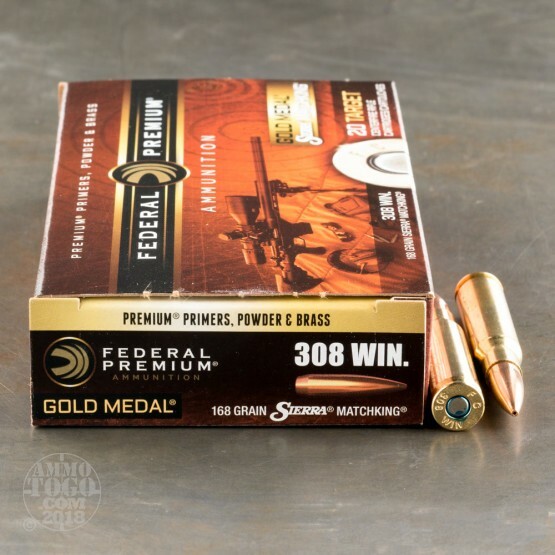 Each 168 grain Sierra MatchKing bullet is loaded into high-quality Federal premium brass. 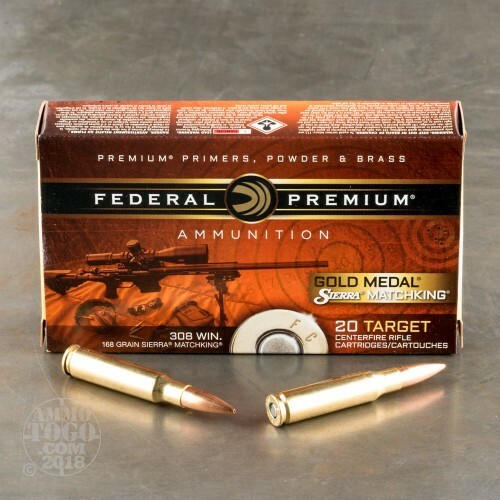 With stringent manufacturing controls, specially formulated propellant, and benchrest-quality Gold Medal primers, this target ammunition delivers high-level consistency and incredible long-range accuracy. 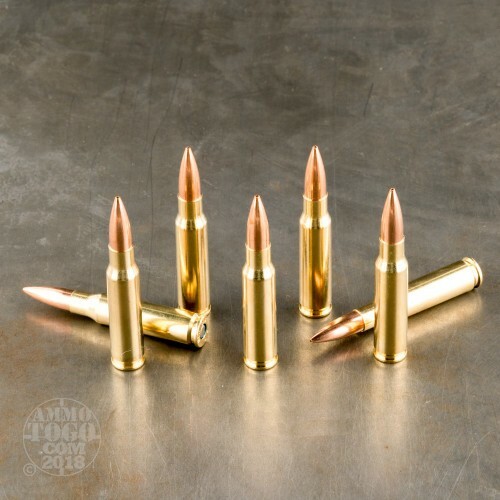 Leaving the muzzle at a velocity of 2650 feet per second with 2619 foot pounds of energy, these .308 Winchester (7.62x51) rounds are some of the most accurate match loads available from a factory. This ammunition comes packed in 20-round boxes. I have used this ammunition for quite a while with great success. It is both accurate and reliable. But like a lot of shooters, I am always looking for something better. Don't ask me why. I have tried quite a few other well known brands of match ammo, and they were very good, but none cycled as smoothly and accurately as Federal. So I will remain with what I know is the best ammunition available. Federal's quality control is above the rest. I have never had an ammo related malfunction with this product. Tried this ammo .308 Gold Medal Match ammo 168 grns from Federal a few weeks ago. I just bought a brand new M1A National Match Rifle from Springfield. Took it to the range. First shot dead center bullseye 100 yards. Cleaned the barrel and let it cool. Second shot was just to the right and almost touching first shot. Cleaned and cool...third shot just above the first 2. Cleaned the rifle and put her away. Also bought a box of the 165grn Federal Vital Shok. Hopefully first shot with it will be on a deer opening day of deer season. Wish I had bought both earlier. Wish I'd had this setup when I qualified with the M14 in 69. The 165grn. has ballistic tip so I'm anxious to see what it does to a deer. I would highly recommend this ammo! I shoot a Bushmaster AR mid length rifle in .308. For some reason my rifle loves this ammunition. Its performance is consistently accurate and functions flawlessly. I prefer hollow point bullets to full metal jacketed ammunition. The quality is excellent. posted on 2/13/15 by RIC IN VA. I USE THIS IN MY AR10 TOPPED WITH A NIKON 4-16. 1" GROUPS @ 200 YDS. NEED I SAY MORE. Shoots great. Usually only one flyer per box. My flyers are when they hit more than .76" from aim point.